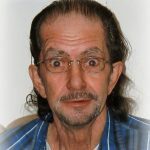 Jim Currall, known to friends as Currly or Birdman, passed away on July 6, 2017. Jim was born in Vancouver but spent his life in Kamloops. He is predeceased by his parents, Reginald and Dorothy (Warren) Currall, his nephew Gabriel Davis and his beloved ferrets. Jim is survived by his daughters Dawn and Debbie, sister Muriel (Currall) Davis (Les), nieces Angela (Suzanne) and Maxine (Nils), nephews Darrin (Jane) and Daniel, as well as many grand nieces and nephews. Jim was a talented design draftsman (Old’s Cool Design & Drafting) and surveyor inspector – a man of many gifts. He had an inventor’s mind – he even designed, but never built, his own dream motorcycle, “The Wayward Wind.” Jim built bicycles as a hobby, was a truly brilliant artist and had an amazing green thumb. He loved animals and always had pets, from birds to fish and his latest, ferrets; he even once had a monkey! Jim will be remembered by his friends and family for his interesting combination of sarcasm, humour and seriousness.